In industry, the biggest source of resistance to the assertion-evidence approach is the claim that assertion-evidence slides do not make an effective handout. While assertion-evidence slides do not contain many of the secondary details that bullet-list slides do, assertion-evidence slides with a little additional work can make more effective handouts than arise from traditional slides built on topic-phrase headlines supported by bullet lists. First, the sentence headline of assertion-evidence slides orients audiences much better than a topic phrase does. Second, as Gordon Shaw argues in the Harvard Business Review, bullet lists do not show hierarchy or connections . Given below are two strategies for creating effective handouts from assertion-evidence slides. ​Although this website has bestowed harsh criticism on PowerPoint's defaults, let us give credit to the program where credit is due. The notes pages option of PowerPoint was a brilliant design feature created by Robert Gaskins and Dennis Austin. Although not used by many presenters, this feature is effective storing secondary details to be spoken on each slide. The space is also excellent for full citations of referenced images and ideas. Given that, a PDF of the notes pages of PowerPoint can make an effective handout. As shown in the example on the right , each page of the handout consists of the assertion-evidence slide at the top with the paragraphs and reference citations of the notes portion beneath. In this arrangement, the reader not only has the main takeaway and supporting visual evidence of each slide (scene), but also has paragraphs giving many of the sub-assertions and supporting background spoken by the presenter during the talk. Moreover, the reader can have full reference citations on this portion presented in a type size that can actually be read. For several of the presentations in the Model Talks section of this website, you will find links to handouts that follow this strategy. One drawback of this strategy is that PowerPoint's word processor in the Notes Pages is crude. You cannot incorporate equations or graphics. Another drawback that some in industry cite is that because they often distribute the PowerPoint file, as opposed to a PDF of the handout, a significant number of recipients either will not look at the notes pages for additional information or will not know how to access the notes pages. Although that hurdle appears to be simply one of education, an alternative means of creating notes pages is needed. Gordon Shaw, Robert Brown, and Philip Bromiley, "Strategic Stories: How 3M Is Rewriting Business Planning," Harvard Business Review (1998), pp. 41–50. 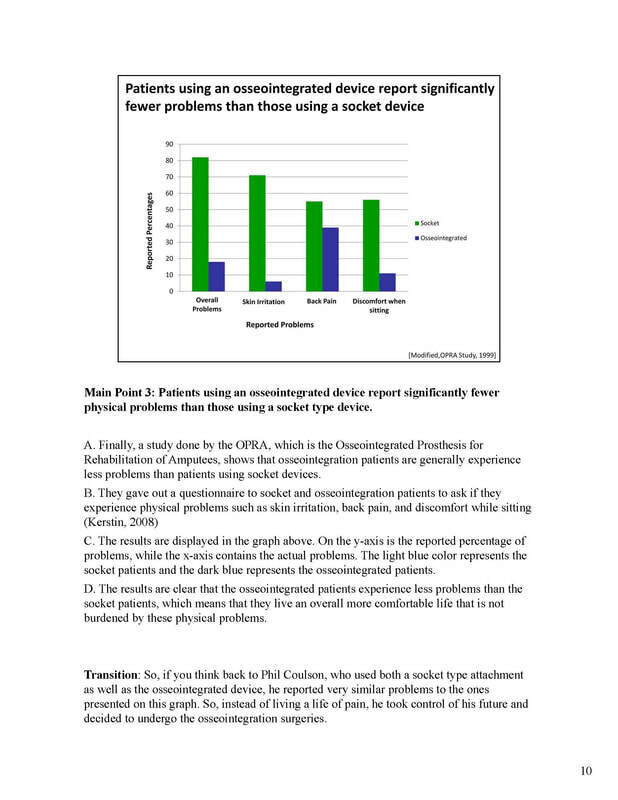 Mimi Overbaugh, "Osseointegration as a Way to Improve the Life of Lower-Limb Amputees," presentation handout (University Park: Leonhard Center Speaking Contest, January 2013). Sample notes page . Note how this page presents secondary details that would pull down a slide that is effective as designed for the presentation.